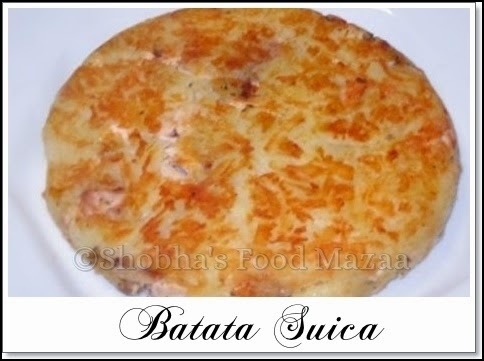 Batata Suica (pronounced - sui-sa) Swiss Potatoes...must've been adapted from a Swiss recipe. Had this in a restaurant in Brazil recently. It was really delicious.... tasted like Hash Brown Potatoes with suffing. I asked chef for the recipe and he gladly explained to me how to make it. It can also be made with other fillings like shredded meat, sliced sausages or vegetables. 1. Half boil the potatoes. Peel and grate them on the thick side of the grater. 2. Boil the chicken adding salt and cut it into small pieces. Alternately you can grill the fillet and cut the pieces. 3. You require 2 flat pans of the same size. In one pan pour olive oil about (2 tbsps) and spread half of the grated potatoes. 4. Spread the chicken pieces and cheese. Also sprinkle the herbs of your choice. Spread the remaining potatoes and a little salt on top. 5. Roast it on medium/low flame for 2-3 minutes, pressing with a spatula. 6. Pour oil again in another pan and carefully flip the other side into it. 7. Roast the other side also pressing with a spatula. Serve hot with crushed pepper/chilli flakes/tabasco. Omg, super tempting batata suica.. 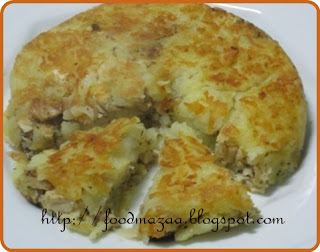 Yes, Rosti also is prepared in the same way but with mashed potatoes. It's quite like the stuffed rosti. Must try a veg version with this. Nice n healthy dish,haven't heard this before..Thanx for sharing! wow, that is so very new, love the idea and this inventive dish. It is a Brazilian dish Priya.. 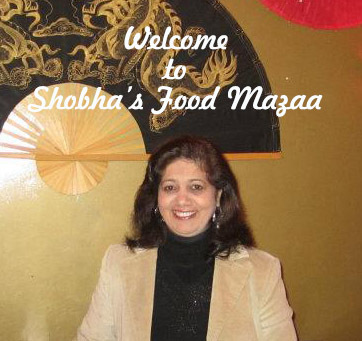 Interesting recipe Shobha! I am loving all your chicken recipes. Keep them coming.. :) Thanks for sending it to Chicken Feast. Very interesting recipe. Thanks for linking my event. Thanks for the award Punitha.